7 of the world’s most powerful tech companies have been accused of forming an antitrust conspiracy to suppress the compensation of their employees by entering into “no poach” agreements. 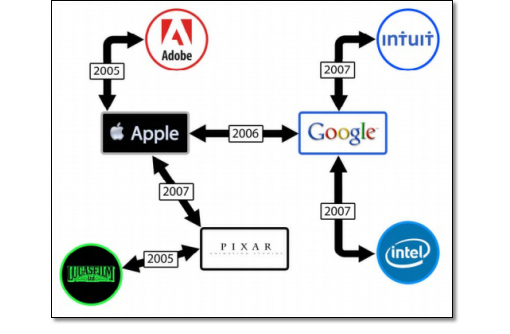 Today, a San Jose judge heard a motion to dismiss a class action civil lawsuit in which former employees seek damages from defendants Apple, Google, Adobe, Intel, Intuit, Pixar, and Lucasfilm. The damning evidence against the defendants from a 2010 Department of Justice investigation that I first uncovered last week, as well as the plaintiffs’ opposition statement indicate there is more than sufficient evidence for the dismissal to be denied and the case to proceed towards trial. If the defendants lose to or settle, tens of thousands of full-time employees with the companies between 2006 and 2009 could be compensated. Specifically, the senior executives of the defendants, including Apple’s Steve Jobs and Google’s Eric Schmidt, are accused of entering into a network of identical, interconnected illegal agreements not to recruit each other’s employees. Each agreement by itself may be a violation of antitrust laws including the Sherman Act, the Cartwright Act, and other California laws. The plaintiffs also claim the agreements constitute an overarching antitrust conspiracy because each was made with knowledge of the other agreements, and relied on the other agreements to achieve a common goal of reducing compensation and mobility for highly sought-after skilled tech employees. The defendants claim that the agreements were isolated and not interconnected. They claim the agreements were pro-competitive parts of legitimate collaborations between the companies, many of which had executives on each other’s boards or started as the same company as with Pixar and Lucasfilm. The defendants also claim “The alleged bilateral arrangement provide no support for the overall conspiracy that plaintiffs have alleged in order to name the defendants in a class action”. They motion for continuation of the partial stay of discovery and for the case to be dismissed. However, my research and sources indicate the defendants’ claims are false, the plaintiffs case is plausible, and so there are no grounds for dismissal. Furthermore, the only reason more evidence about the interconnection between the agreements isn’t available is because they were made so secretively. The case should be allowed to proceed because the plaintiffs have produced “smoking guns” indicating a deep conspiracy. Specifically, “Do Not Cold Call” lists which defendants used to implement the agreements, and the written terms of Pixar’s agreement with Lucasfilm. These signal that today’s joint motion to dismiss the case should be denied because if discovery is permitted to continue, there’s a reasonable expectation that evidence of illegal activity will be revealed. Finally, the precedent is that motions to dismiss are “viewed with disfavor and are properly granted only in exceptional cases…A complaint satisfies Twombly [is only eligible for dismissal] if the allegations, taken as a whole, are not ‘facially implausible'” according to the plaintiffs’ statement. Therefore, it would take a very strong presentation by the defense for Judge Lucy Koh to dismiss the case. If the defendants’ motion to dismiss the case is denied, the case will move towards a trial by jury in June 2013. Rather than leave an assessment of damages to the judge and jury, the defendants may try to settle the case, similar to how they settled with the Department of Justice’s federal case in 2010. In the defendants lose or settle, full-time employees of the defendants could be compensated for the 10-15% of lost wages estimated by the plaintiffs’ law firm Lieff Cabraser. Update 4:30pm PST 1/26/2012: The judge has lifted the stay of discovery, saying “This case is moving forward…this case is going to survive the motion to dismiss.” Though her official statement hasn’t been filed, she’s likely to deny the defendants motion to dismiss the case. She also ordered Google to produce draft emails in addition to sent emails, and designate which are drafts and which were sent. During the hearing, the defense argued against the conspiracy accusation and joint liability. It stated that plaintiffs don’t deserve compensation from companies they never worked for and that their employers didn’t have agreements with just because they were part of the so-called conspiracy. The judge seemed somewhat sympathetic to this, and asked if the plaintiffs would consider breaking up the case to focus on each unlawful agreement separately. The plaintiffs maintained that the agreements were all interconnected. Afterwards, The head attorney representing the plaintiffs, Joseph R. Saveri of Lieff Cabraser, told me the plaintiffs were comfortable moving forward with their single, joint antitrust conspiracy complaint. The plaintiffs will file an amended complaint that removes any claims dismissed by the forthcoming judge’s statement. Next, another Case Management Conference is set for April 18th, where that amended complaint from the plaintiff will be reviewed. On June 28th, the court will convene to hear class certification to define what employees are eligible to be represented by the class action lawsuit. The plaintiffs plan to assess evidence surfaced during discovery and determine if only software engineers, software engineers and scientists, or all of the defendants’ employees will be represented by the class action lawsuit. Following the hearing, Saveri gave reporters a conservative calculation of the possible damages that employees could be compensated for. He said software engineers make $100,000 a year (they make more), their compensation was “suppressed between 5 and 10%” and “tens of thousands of employees were affected”. That means for each year an entry-level full-time software engineer worked at one of these companies, they might be entitled to damages of $5,000 to $10,000. Higher paid veteran engineers could be entitled to much more. The total damages could therefore be at least $150 million if just 10,000 entry-level engineers were affected.